BRIDGEWATER – Tyler Burnham drilled a line single to center on the first pitch he saw in the bottom of the seventh inning to win his own game Friday night and East Brunswick won the Greater Middlesex Conference Tournament championship with a 1-0 victory over J.P. Stevens at TD Bank Ballpark. Burnham, who allowed only two hits without a walk as a pitcher, has been an offensive machine all spring for the Bears, who finished 20-3. East Brunswick, which had only three hits, put the game-winning rally together during a strange last of the seventh. Jay Marchese drew a walk to open the inning. Dan Iannarone dropped down a bunt. J.P. Stevens’ catcher Luke Jacobi fielded the bunt but his throw went down the right field line. Courtesy runner David Paribello circled the bases, East Brunswick jumped into a pile at home plate and water buckets were emptied on the team. Home plate umpire Steve Columbus immediately called interference on Iannarone, who was running on the infield grass. After a short conference, the umpires returned Paribello to first base. After order was restored, Nick Clemente popped up behind second where three J.P. Stevens defenders came together. The ball popped out of a glove for an error and runners were on first and second. The wackiness continued when Juan Ganzoroli hit a pop up behind the plate. Jacobi made the play at the screen, reaching back to make a circus catch. The two runners alertly tagged putting runners at second and third. J.P. Stevens head coach Dave Marzano opted not to walk Burnham, the cleanup hitter with a base open. He jumped on a hanging breaking ball and slammed it into center plating the game’s only run. Alex Zilli allowed one hit in six shutout innings, striking out nine, as J.P. Stevens defeated Piscataway, 5-0, in Edison. Zilli, Frank Loguidice, Zach Marzano, Michael Katims and Matt Pastor each drove in a run for J.P. Stevens, which scored twice in the third and fourth innings en route to its 20th win this season. Kyle Mortensen went 2-for-3 with a double, two RBI and a run as seventh-seeded Woodbridge defeated 10th-seeded J.P. Stevens, 7-1, in the first round of the North Jersey, Section 2, Group 4 tournament in Woodbridge. Woodbridge scored four runs in the fifth inning. Zach Joe doubled, scored two runs and had an RBI, while Nick Bradshaw scored two runs. Harry Rutkowski doubled, had two RBI and scored a run. Rutkowski allowed six hits, one earned run, two walks and struck out 12. Frank LoGuidice allowed six hits, no runs, no walks and had one strikeout as ninth-seeded J.P. Stevens had a 5-0 shutout of fifth-seeded St. Joseph (Met.) in the semifinal round of the Greater Middlesex Conference Tournament in Metuchen. LoGuidice improved to 7-1 following the shutout. J.P. Stevens, which had 10 hits, scored four runs in the fifth inning. Zachary Marzano was 2-for-4 with an RBI and a run, while Kevin WU had two RBI and scored a run. Matthew Elko had an RBI, while Matthew Pastor went 2-for-3 with a run. Zachary Marzano pitched a four-hit shutout to lead ninth-seeded J.P. Stevens to a 1-0 win over top-seeded Edison in the quarterfinal round of the Greater Middlesex Conference Tournament at North Brunswick Community Park. The win was the 13th consecutive win for J.P. Stevens. Marzano struck out six and walked three. In the second inning, Ryan Katims led off with a single. After Steven Zederbaum walked, Matthew Pastor hit an RBI single which scored Katims for the only run of the game. Eric Heatter gave up one run on five hits, struck out 11, and walked four over seven innings for Monroe. Frank LoGuidice scattered eight hits over seven innings, allowing two runs and two walks with five strikeouts for ninth-seeded J.P. Stevens as it defeated eighth-seeded Old Bridge, 8-2, in the first round of the Greater Middlesex Tournament in Matawan. Zachary Marzano had a three-run double for J.P. Stevens, which scored four of its eight runs in the sixth inning. Alex Zilli was 3-for-4 with one RBI. Alex Zilli allowed six hits, no runs, two walks and struck out six in six innings as ninth-seeded J.P. Stevens had a 6-0 shutout of 24th-seeded New Brunswick in the preliminary round of the Greater Middlesex Conference Tournament in Edison. J.P. Stevens scored two runs apiece in the first and third inning. Michael Katims hit a home run, while Luke Jacobi tripled and scored a run. Frank LoGuidice scored a run and had an RBI. New Brunswicks Yaurys Mendez had two hits. J.P. Stevens will play eighth-seeded Old Bridge in the first round Monday at Old Bridge. Senior Jared Frarccio pitched a six-hitter with one walk and four strikeouts to help J.P. Stevens earn a 7-3 victory over South River in Edison. Down 3-2 after the second inning, J.P. Stevens scored three runs in the bottom of the fourth to take a 5-3 lead. Luke Jacobi went 2-for-2 with a two-run triple, while Zachary Marzano went 2-for-4 with a run and an RBI. Frank LoGuidice went 1-for-3 with an RBI, while Kevin Wu went 2-for-3 with an RBI. Matthew Elko and Alex Zilli both went 1-for-3 with a run for J.P. Stevens. Michael Katims hit a two-run home run in the bottom of the seventh inning to give J.P. Stevens a 2-1 victory over St. Joseph of Metuchen in Edison. Frank LoGuidice pitched a two-hitter with one walk with seven strikeouts for J.P. Stevens, which out-hit St. Joseph, 5-2. LoGuidice, Luke Jacobi, Zachary Marzano and Kevin Wu chipped in one hit each. Kyle Subers pitched 6 2/3 innings, allowing five hits, two runs and two walks with four strikeouts for St. Joseph. Kyle Angel was 1-for-3 with one RBI. Frank LoGuidice went 4-for-4 with three RBI aand a run and Kevin Wu added two hits with an RBI and a run to lead J.P. Stevens to a 7-5 victory over Piscataway in Piscataway. Zachary Marzano won his fourth game of the season, allowing six hits over five innings with two earned runs, three walks, and four strikeouts for J.P. Stevens. Alex Zilli pitched six innings, allowing six hits, three runs, and two walks with seven strikeouts for J.P Stevens as it defeated Elizabeth, 6-3, in eight innings in Elizabeth. Luke Jacobi, Matthew Elko, Zachary Marzano and Michael Katims had two hits each for J.P. Stevens, which scored three runs in the eighth inning. The resilient Hawks (10-7) continued their roller-coaster ride of a season, extending their winning streak to five games by outhitting the Bombers 12-4. Luke Jacobi, Kevin Wu (two RBI), Matt Elko, Alex Zilli (two RBI), Mike Katims, Steven Zederbaum contributed two hits apiece to the win. Jacobi, Wu and Katims each doubled. Winning pitcher Frank LoGuidice went the distance, fanning eight, walking three and allowing one earned run. He induced eight groundball outs and threw first-pitch strikes to more than half the batters he faced. After jumping out to a 3-0 lead in the first, the Hawks tacked on single runs I the third, fifth and sixth innings. Sayreville scored its lone run in the second as Michael Bertrand doubled home Chris Hauber. Losing pitcher Kyle Lewis allowed four earned runs on 10 hits over five innings. The Bombers (5-9) have lost three in a row. Zachary Marzano pitched a four-hit shutout, allowing two walks with 10 strikeouts for J.P. Stevens as it defeated Sayreville, 1-0, in Parlin. Alex Zilli had an RBI groundout in the second inning to score the only run of the game for J.P. Stevens. Kevin Wu and Frank LoGuidice had one hit each. Connor Johnson pitched a two-hitter, allowing one run and one walk with five strikeouts for Sayreville. Joe Polomene was 2-for-3. NORTH BRUNSWICK – When senior starting pitcher Alex Zilli drove in the game-winning run in the bottom of the seventh inning, he didn’t just win it for his team. He also won it for a much greater cause. With one out and runners on second and third base, Zilli smacked a fastball the opposite way to right field, driving home third baseman Kevin Wu to give the J.P. Stevens High School baseball team (8-7) a 4-3 walk off victory against Governor Livingston (8-5) on Saturday afternoon at North Brunswick Community Park. 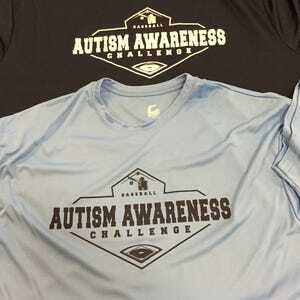 The game took place on the second day of the Autism Awareness Challenge, a grassroots effort led by Mike Garlatti, a former Highland Park star and Rutgers University assistant coach who is now a Colorado Rockies scout, aiming to raise money and awareness for autism research. Starting J.P. Stevens senior designated hitter Ben Mandell’s younger brother, Sam, who is autistic, threw out the ceremonial first pitch. After Mandell, in his first career start, laid down a bunt in the bottom of the sixth to drive home Zilli, who scored on a throwing error, to tie the game at three, Zilli had a very simple approach at the plate with the game on the line. Zilli’s day on the mound got off to an inauspicious start, giving up back-to-back solo home runs to Governor Livingston sluggers Drew Compton and Danny Baroff in the top of the first inning. After getting the final two outs of the inning, Zilli settled in nicely, giving up only one more run over the next five innings. The win on Saturday extends the Hawks’ winning streak to three games, but this new streaks comes on the heels of a six game losing streak. According to J.P. Stevens coach Dave Marzano, it’s been upperclassmen like Zilli who have righted the ship for the Hawks. Alex Zilli went 2-for-3 with four RBI and a run as J.P. Stevens defeated Perth Amboy, 8-7, in Perth Amboy. J.P. Stevens scored four runs apiece in the fourth and seventh inning. Zachary Marzano was 2-for-3 with two runs, while Frank LoGuidice scored two runs and had an RBI. Matthew Elko hit a sacrifice fly to cap a three-run sixth inning that lifted J.P. Stevens to a 5-4 victory over Perth Amboy in Edison. Zach Marzano reached on an error and Kevin Wu, who was 2-for-3, singled leading off the fifth, then both scored when Frank Loguidice's sacrifice bunt was thrown away, sending Loguidice all the way to third. Elko followed with his game-winning RBI. Sergio Ramos went 4-for-4 with an RBI and Jordanny Nunez was 2-for-3 for Perth Amboy, which scored twice in the third and fifth innings to erase a 2-0 deficit. Daniel Iannarone went 2-for-4 with two runs to lead East Brunswick to a 5-2 victory over J.P. Stevens in Edison. East Brunswick led 3-1 going into the sixth inning and tacked on two more runs in the top of the sixth. Juan Ganzaroli went 1-for-2 with two RBI and one run for East Brunswick, Ryan Flynn had two hits with an RBI and one run, and Chris Cap had two hits with an RBI. Tyler Burnham pitched six innings allowing five hits and two runs with five strikeouts and two walks. Kevin Wu went 1-for-2 with an RBI for J.P. Stevens and Zachary Marzano had two hits and one run. Marzano pitched five innings allowing nine hits and three runs with four strikeouts and four walks. Nicholas Clemente was 2-for-4 with one RBI for East Brunswick as it defeated J.P. Stevens, 9-6, in East Brunswick. Ryan Flynn was 2-for-3 with one RBI for East Brunswick, which scored six of its nine runs in the third inning. Tyler Burnham was 3-for-4 with two RBI. Chris James was 3-for-3 with two RBI for South Brunswick as it defeated J.P. Stevens, No. 15 in the NJ.com Top 20, 17-0, in Edison. Kevin Reyes was 2-for-3 for South Brunswick, which rallied with an 11-0 fourth inning. Ryan Moran and Marco Dilusto each had one hit with two RBI. Brandon Siroki was 2-for-4 with two doubles and one RBI. Troy Sweeny was 1-for-1 with a double. Carlos Lopez pitched a five-inning three-hitter with two strikeouts and two walks as Old Bridge defeated J.P. Stevens, No. 15 in the NJ.com Top 20, 11-1, in Edison. Zach Attianese went 2-for-2 with two runs, three RBI and one double and Mike Russo had three runs for Old Bridge, which had a total of 10 hits and scored five runs in the fifth inning. Rob Laconti went 2-for-3 with one run and one RBI, Peter Marottoli went 1-for-2 with three RBI and Luis Cruz added two runs. Frank LoGuidice had one run, Zachary Marzano contributed one RBI and Michael Katims pitched a five-inning 11-hitter with two strikeouts and three walks for J.P. Stevens. Zach Attianese drove in two runs and scored once to lead Old Bridge to a 5-4 victory over J.P. Stevens, No. 15 in the NJ.com Top 20, in Matawan. Old Bridge broke a 1-1 tie in the bottom of the third inning with four runs and held off J.P. Stevens to maintain the advantage. Peter Marottoli went 1-for-3 with an RBI and one run for Old Bridge and Tom Giasi went 2-for-3 with an RBI. Billy Geiger pitched five innings, allowing five hits and four runs with two strikeouts and four walks and Attianese pitched two innings, allowing one hit and no runs with two strikeouts and two walks. Zachary Marzano went 3-for-3 with two runs for J.P. Stevens and Luke Jacobi and Frank LoGuidice both had one hit and scored once. Matthew Eiko had a hit with two RBI and Michael Kati's had one hit with an RBI. John Zanfordino knocked in Justin Hernandez in the bottom of the seventh as Edison pulled out a 5-4 victory over J.P. Stevens at Edison Baseball Field in Edison. Trailing 4-0, Edison rallied for four runs in the bottom of the sixth fueled by Mike Fogarty's two-run double. Nick Peterson picked up an RBI on a fielder's choice to tie the game at four. Justin Hernandez pitched the first five innings, yielding four earned runs before Kyle Telesnick came in to pitch a scoreless seventh and pick up a win in relief. Kevin Wu had the first RBI for J.P Stevens in the second inning bringing home Matt Elko to take a 1-0 lead. Matthew Pastor, Luke Jacobi and Zach Marzano each added RBI for J.P. Stevens. Frank LoGuidice tossed a complete game and notched a walk-off hit in the seventh inning as J.P. Stevens earned a 2-1 win over Edison in Somerset. LoGuidice scored Matt Pastor with a hit in the bottom of the seventh to seal the win. He finished 2-for-3 with a double at the plate and allowed one run on three hits on the mound .Matthew Elso finished 1-for-3 and drove in J.P. Stevens' other run in the first inning. John Redman pused Lenin Gomez across the plate to tie the game at 1-1 in the top of the seventh for Edison. Brandon Radd threw 6 1/3 innings, allowing two runs on eight hits. Luke Jacob went 3-for-5 with an RBI and three runs scored to lead J.P. Stevens, No. 14 in the NJ.com Top 20, to a 7-4 victory over Iselin Kennedy. Iselin Kennedy led, 4-1, going into the third inning before J.P. Stevens scored four goals and added two more in the sixth. Matthew Elko went 1-for-3 with an RBI and two runs for J.P. Stevens and Steven Zederbaum had two hits and three RBI. Michael Katims pitched a four-hitter to win it. Ariel Tejeda went 1-for-2 with two runs for Iselin Kennedy, Josh Buchholz and Jeremy Torres both had a hit with an RBI and Tyler Sharfetz had a hit and scored once. Brandon Siroki starred for South Brunswick going 3-for-3 with a triple and four RBI in its 11-1 victory over J.P. Stevens in Monmouth Junction. Kevin Reyes went 2-for-3 with three RBI four South Brunswick, which scored four runs in the third and fourth innings. Anthony Sjolund pitched a two-hitter over five innings to record the victory on the mound. Matthew Pastor recorded a double for J.P. Stevens. Zachary Marzano homered and drove in four runs while throwing a five-inning, two-hit shutout as J.P. Stevens ran past Johnson, 10-0, in Clark. Marzano walked one and struck out six in picking up the victory on the mound for J.P. Stevens, which scored three runs in the third inning to take a 4-0 lead. Kevin Wu doubled and drove in a pair of runs and Luke Jacobi, Frank LoGuidice, Matthew Elko and Alez Zili each scored twice for J.P. Stevens. Brendan Stanzione and Mitch Becker had hits for Johnson. Frank LoGuidice tossed a five-hitter as J.P. Stevens defeated Msgr. Bonner of Pennsylvania, 5-1, at the ESPN Wide World of Sports in Orlando, Florida. LoGuidice struck out 10 and walked none while allowing just one unearned run. Luke Joacobi, Zachary Marzano, Matthew Elko and Steven Zederbaum each drove in one run for J.P. Stevens, which took a 3-0 lead in the bottom of the second inning. Alex Zilli allowed four hits over six innings, striking out 10, to pitch J.P. Stevens to a 4-2 victory over Eastern, No. 10 in the NJ.com Top 20, in Orlando. Zilli allowed two earned runs and two walks for J.P. Stevens, which built a 3-0 lead with three runs in the fourth inning. Luke Jacobi had a single and two RBI in the victory, while Matthew Pastor had a hit and an RBI and scored a run, Michael Katims had a hit and an RBI and Kevin Wu and Frank Loguidice each scored a run. Eastern was led by Lou Priolo, who was 2-for-3 with one run and an RBI. Tommy Katsaros, Tyler Travis and Frank Pallante all had hits for Eastern. Nolan Rivera hit a sacrifice fly to drive home Sean McDonnell for the game-winning run in the eighth inning as eighth-seeded Sayreville defeated top-seeded J.P. Stevens, 6-5, in the quarterfinal round of the Greater Middlesex Conference Tournament in Edison. Pete Soporowski pitched a seven-hitter, allowing five runs, striking out eight and walking four. Soporowski was 1-for-4 with an RBI. Chris Eveigan was 3-for-5 with an RBI for Sayreville. Nolan Rivera was 1-for-2 with a run and an RBI and Brett Dzamba was 2-for-4 with an RBI. Collin Pastor was 2-for-5 with two runs for J.P. Stevens. Frank LoGuidice was 2-for-4 with two RBI and Zachary Marzano was 1-for-2 with an RBI. Sayreville will play St. Joseph (Metuchen) on Saturday at 2:30 p.m. at East Brunswick Vo-tech in the semifinal round. Matthew Elko went 3-for-3 with an RBI and a run to lead first-seed J.P. Stevens to a 5-3 win over 17th-seed Spotswood in the first round of the Greater Middlesex Conference Tournament in Edison. Zachary Marzano went 2-for-2 with a double, an RBI, and two runs for J.P. Stevens. Chase Fee went 1-for-4 with an RBI for Spotswood. Alex Zilli hit a single in the bottom of the fifth inning for two RBI to lift J.P. Stevens to a 9-6 win over Johnson in Edison. Trailing 2-1 entering the fifth, J.P. Stevens combined to score five runs. Zachary Marzano went 2-for-3 and registered two RBI and Frank LoGuidice and Matthew Elko each added an RBI. Michael Katims pitched six innings for five strikeouts and two walks to earn the win for J.P. Stevens. Rob Horvath went 2-for-3 and totaled three RBI for Johnson. Zachary Marzano went 1-for-3 with one run and an RBI to lead J.P. Stevens to a 4-2 victory over Rahway in Edison. J.P. Steven led 4-0 following the third inning. Matthew Elko, Andrew Stevens and Frank LoGuidice each had a hit with one run for J.P. Stevens. LoGuidice also pitched a one-hitter through three innings allowing no runs with three strikeouts and one walk. Tyler West had two RBI for Rahway and Brandon Munoz had a hit with one run. One might think the J.P. Stevens High School baseball team's recent flair for the dramatic would start taking its toll on Dave Marzano, but the veteran head coach is actually gaining confidence with each late-inning victory. Mike Katims' two-out RBI double in the bottom of the sixth, a complete-game three-hitter from Frank LoGuidice and a clutch defensive play that erased a runner headed for home in the top of the seventh propelled the Hawks to Monday's 2-1 Greater Middlesex Conference Red Division win over Piscataway. The victory was the ninth in the past 10 games for the Hawks (13-6 overall, 10-5 division) and their fourth straight in their final at-bat. J.P. Stevens kept alive its hopes of sharing the division championship with Old Bridge and perhaps securing at least the No. 2 seed for the league tournament, which will be seeded on Thursday and commence on Friday. The Knights can win the division title outright with a win over South Brunswick on Tuesday, but the combination of an Old Bridge loss and a J.P. Stevens victory over Piscataway on Tuesday means the schools would share the division crown. Throughout the 2015 campaign, which the Hawks entered with high hopes after reaching last July's GMC Baseball Coaches Association Summer League tournament final, J.P. Stevens has had no shortage of heroes. "We've had some really tight games," Marzano said, "and come late in the game with these guys everybody wants to bat and everybody wants to be in that position to help us win the game. As long as we get the win, the guys are happy for each other and it doesn't matter who gets the job done." Players on this tight-knit and selfless ball club have seemingly taken turns leading the Hawks, with Monday's win over Piscataway serving as a microcosm for the season. "I just felt like at that point we were going to win the game," said Marzano, who was unfazed after his team, which took a 1-0 lead on Zach Marzano's first-inning RBI double, allowed a game-tying sacrifice fly in the top of the sixth. "The first couple of (late-inning wins) I was like, 'What are we doing? Why can't we put these teams away?' Today it just felt different, like we were going to pull it out. We've been in these situations before. My guys have just been coming up big." LoGuidice, who induced a game-ending groundout with two aboard, contributed to the drama before improving his record to 5-2 and lowering his ERA to 1.51. He allowed a seventh-inning leadoff double to Mike Campbell, who was erased in a rundown between third and home when infielder Alex Zilli short-hopped a throw to Zach Marzano at first on Kevin Tamsula's grounder. Defense alienated the Hawks early this season, as J.P. Stevens committed three errors in each of its consecutive season-opening losses to defending conference tournament champion St. Joseph and made seven miscues in a defeat at the hands of crosstown rival Edison. "The difference in the last three weeks has been the defense, especially up the middle with (shortstop) Collin Pastor and (second baseman) Dennis Cooper," Dave Marzano said. "We said from Day One if we make the plays, we're going to be in every game." A team captain, Pastor played almost exclusively in the outfield before entering high school, but played third and second base last spring before replacing All-Division shortstop Joe Siecinski this year. "He was the guy who wanted to help the team any way he could," Dave Marzano said. "He saw an opportunity, decided to move to the infield and he's been fantastic." The Hawks also discovered some depth on the mound with Zach Marzano (2-1, 1.43) and Zilli (2-1, 1.97) complementing LoGuidice. Zach Marzano pitched throughout his youth until he experienced some arm tenderness when he turned 13 years old. After throwing during the offseason with the Full Count showcase team, he took the hill for the Hawks this year. Marzano has hit nine batters, making it difficult for them to dig in at the plate. "The pitching all year has been unbelievable," Dave Marzano said. "We knew what Frank LoGuidice was coming in as our No. 1. It was just a matter of how the supporting cast would do. Both Alex and Zach stepped up big time." J.P. Stevens entered Monday's game batting .275 as a team with Luke Jacobi (.418), Zach Marzano (.358) and LoGuidice (.328) as the team's lone hitters above .300. Jacobi leads the entire conference with 26 runs scored. The rest of the club, including Matthew Elko and Joseph Pecararo, have registered timely hits, evidenced by J.P. Stevens' .325 batting average with runners in scoring position. An at-bat from Jacobi which ignited a four-run rally that snapped a 2-2 deadlock in the sixth inning of last Friday's comeback victory over Elizabeth epitomized the Hawks' scrappiness at the plate. Down 0-2 in the count, Jacobi fouled off one two-strike pitch after another during an epic 13-pitch at-bat before belting a three-run double to the gap. His plate appearance illustrates how the Hawks, who last lost a conference game on April 16, find ways to win. Luke Jacobi went 2-for-4 with a double, three RBI and two runs scored as the Hawks won for the eighth time in their last nine games. J.P. Stevens scored twice in the fifth inning to erase a 2-1 deficit. After the Minutemen knotted the contest in the top of the sixth, the Hawks answered with four runs in the bottom of the inning. The victory was J.P. Stevens' third straight in its final at-bat and made a winner out of starting pitcher Michael Katims, who fanned five and walked two over six innings. Colin Pastor and Frank LoGuidice each had a hit and an RBI for the Hawks, while teammate Matthew Elko went 2-for-2. Eight different Hawks recorded at least one hit and five different Hawks scored at least one run in a balanced effort. Matt Elko's two-run single off ace Victor Dudka erased a 1-0 deficit in the home sixth as the Hawks won their second consecutive game in their final at-bat. J.P. Stevens (11-6) has won seven of its last eight and kept alive its hopes at claiming at least a share of the Red Division title. Frank LoGuidice led off the sixth with a single. After Zach Marzano flied out, Michael Katims singled to left. Alex Zilli followed with a single to load the bases. Elko then singled up the middle. Reliever Dennis Cooper, who induced Dudka into a game-ending groundout with two aboard in the seventh, pitched the final two frames for his third win of the season. Tyler McNamara went 2-for-2 with a double for he Bears (10-8), who have dropped three of their last six. East Brunswick was outhit 7-4. The Hawks (6-5) rallied for single runs in the first, second and fourth innings to provide winning pitcher Alex Zilli with an early lead. Zilli scattered five hits, fanned four, walked four and allowed an earned run in the seventh on Gerard Pepe's RBI single. Luke Jacobi went 4-for-4 and scored twice for the Hawks. He crossed on Frank LoGuidice's second double of the game in the second inning. Zach Marzano, who delivered a clutch two-out RBI single in the first, and Collin Pastor, who had a clutch grounds-rule RBI double in the fourth, collected two hits apiece for J.P. Stevens. Daniel Iannarone went 3-for-3 and scored East Brunswick's lone run. Nick Clemente took the loss, pitching the first four innings. He allowed three runs on five hits while striking out four and walking three. Frank LoGuidice pitched seven innings with six strikeouts and one RBI as J.P. Stevens defeated Old Bridge 4-3, in Edison. Luke Jacobi went 1-for-2 with one double, a run and an RBI while Joseph Pecararo went 1-for-2 with one RBI, Dennis Cooper went 1-for-1 with two runs and Zachary Marzano had a run for J.P. Stevens. Luis Cruz went 2-for-3 with a run and RBI while Jimmy Freel Jr. had two RBI and Brian Hulaysia had a run for Old Bridge. Alex Zilli pitched a complete game shutout for J.P. Stevens (2-2). Zilli struck out five batters and allowed four hits for the Hawks. Frank LoGuidice went 1-3 with an RBI and a run scored for J.P. Stevens. Anthony Sjolung pitched 4.2 innings with four strikeouts and an unearned run for South Brunswick (1-4). Zachary Marzano finished 3-for-3 at the plate with a double and two RBI while tossing six effective innings on the mound as J.P. Stevens defeated Carteret, 9-4, in Carteret. Marzano allowed four runs on 10 hits, walked one and struck out five for J.P. Stevens, which scored twice in the fifth and four more runs in the sixth. CARTERET — A product of the Carteret Little League program, Jasdeep Buttar returned to his old neighborhood to haunt his former teammates. The senior right-hander hurled a complete-game six-hitter and went 3-for-4 with a homer, two RBI and three runs scored, leading the J.P. Stevens High School baseball team to Saturday’s 8-3 victory over Carteret at Sullivan Field. “I was real excited to come here and play,” said Buttar, whose cousin, Puneet, a former Carteret star, trained him to be a left-handed power hitter. The homecoming was bittersweet for Buttar, who moved to North Edison when he was 12 after spending six years as one of the best players in Carteret’s Little League system. “He was always the best one on our (All-Star) team, the one who always gave us confidence,” said Carteret first baseman Anthony Spinelli, Buttar’s former Little League teammate. As the Hawks’ captain, Buttar’s role hasn’t changed. He is the ace of the team’s staff (2-1, 1.75) and its leading batter (.358, 4 HR, 11 RBI). The Hawks needed more than five innings to figure out Carteret starter Randy Morla, who compensated for a lack of velocity with pinpoint control. He induced nine groundball outs over the first four innings as shortstop Joey Nigro and Spinelli flashed some fancy glove work. No. 7 batter Drew Blanco belted a two-run double in the sixth and a two-run single in the seventh as the Hawks scored five runs over the final two frames to break a 3-3 deadlock. Carteret (1-11) took a 2-0 lead in the home first when Eric Fruscella scored on the back end of a double steal and Spinelli followed with an RBI triple off his old teammate. Buttar cut the deficit in half with a second-inning homer over the centerfield fence that Carteret coach Mark Domashinski said was the best hit ball off his team this year. After Nico Condito’s third-inning sacrifice fly made the score 2-2, the Hawks took a 3-2 lead in the fifth on Chris Lee’s sacrifice fly. Carteret knotted the contest 3-3 on Spinelli’s RBI single in the bottom half of the inning. J.P. Stevens (4-5), which began the year ranked No. 10 in the Home News Tribune, entered Saturday’s game having lost five of its last six including two losses apiece to defending Greater Middlesex Conference Red Division co-champions South Brunswick and St. Joseph (two of those setbacks were by a total of three runs). After falling 10-0 to Piscataway on April 13, Buttar pitched (10 strikeouts) and batted (two homers) J.P. Stevens the following day to a 13-3 win over the Chiefs. “When we were struggling at the plate, struggling making plays, I felt like Jasdeep really put the team on his back,” J.P. Stevens coach Dave Marzano said. No. 9 batter Joe Siecinski went 3-for-3 for the Hawks with two runs scored. The age-old recipe for cooking up a winning high school baseball season is quality pitching and reliable defense. J.P. Stevens High School is fortunate to possess both, which is why veteran coach Dave Marzano is cautiously optimistic about the Hawks’ improving last year’s 9-17 record. The pitching trio starts with Justin Wojciechowski, a junior, who registered a teamleading five victories in 2011. He is joined by senior Jasdeep Buttar, who accounted for the other three wins. Senior Drew Blanco didn’t earn a victory, but Marzano utilized the veteran against the toughest opponents. In addition, senior Josh Anes will be counted on to relieve the starters and be the closer. The outfield returns intact, and all are juniors. Chris Lee batted over .400 the past two seasons, Jared Mincey hit for a .316 average with 18 steals as the lead-off man, and Trevor Yelencsics hit .306 and led the Hawks with three home runs. Behind the plate is hefty Nico Condito, who competed in the state wrestling championships. He batted .294 with seven extrabase hits. Buttar may play at either first or third and could also be the designated hitter. After Mincey, JPS will bat Yelencsics in the second spot, where he is a power threat in addition to being capable of running the bases. Lee occupies the third position, and Condito bats fourth. Buttar is slated for the fifth position, and senior Anthony Rienzo and junior Dario Bryzowski are waging a competition for starting at second base. Juniors Jimmy Boyle and Eric Stiener could see action at third when Buttar is pitching or plays first. Senior Joe Siecinski will start at shortstop, and Wojciechowski, Blanco, Stiener and Boyle may get at-bats as the DH. When asked which was the toughest opponent on the schedule, Marzano didn’t hesitate with his answer. “Our crosstown rival, Edison, is always our toughest,” he said. “Year in and out, Edison has a great program; the competition always raises the level of play, and it’s fun to go against each other. The Hawks open their season April 2 at home against Edison, travel to J.F. Kennedy Memorial onApril 5, and play a home-andhome series with St. Joseph of Metuchen on April 7 and 9. The Star Ledger, April 17, 2011 6:32 p.m.
Darwin Cruz went 2-for-3 with four RBI as J.P. Stevens (4-5) earned a split of a doubleheader with Edison (5-3) at TD Bank Ballpark in Bridgewater. Peter Protnicki had a single, a run-scoring triple and walked three times as he went 4-for-5 with two doubles, a triple and four runs in the two contests. John Wojciechowski (2-1) struck out four and walked one in six innings to earn the victory. Catcher Justin Duran went 3-for-3 with two doubles and two RBI for Edison. The Star Ledger, April 17, 2011 7:52 p.m.
Starter Vinny Zanfordino (1-1) doubled home a run in the first and tripled home two more in the second as Edison (5-2) did all of its scoring in the first two innings at TD Bank Ballpark in Bridgewater. Pete Protnicki doubled and scored twice and drove in a run with a sacrifice fly while Nico Condito went 3-for-4 with an RBI double for J.P. Stevens (3-5). Drew Blanco (0-3) went the distance, striking out seven and walking one for J.P. Stevens, which had runners on first and third when Edison reliever Mitch D'Amato induced an infield pop-up to end the contest. Former John P. Stevens High School baseball standout Dave Marzano wants his alma mater to return to the days when it regularly competed for the Greater Middlesex Conference Red Division and Tournament titles. He has as much stake, if not more, in how the Hawks perform — he’s the coach. “Since we won 17 games four years ago,” said Marzano, “it’s been a struggle, especially with the improvement in the Red Division. “Every game is competitive,” he added. The proximity of the Edison Township high school to three private and parochial high schools, all within a two-mile radius, has had an impact on JPS’s ability to maintain its winning tradition, not only in baseball but in other sports. Marzano contends that Stevens loses at least one, sometimes more, top prospects to St. Joseph of Metuchen, Bishop Ahr and Wardlaw-Hartridge. Last year the Hawks finished 5-18 but won three of their last five games. The top two pitchers, however, graduated, which means an untested mound staff needs to carry the load. The junior was on track to start last season but suffered a separated shoulder early in the campaign. Candito rehabbed during the offseason, and his strong performance at bat and behind the plate in Stevens’ first scrimmage this spring showed he’s ready. When it does, Marzano expects Drew Blanco, Justin Wojciechowski, Santos Zabala and Buttar to be the starters on his pitching staff. He will use the rest of the preseason to determine who joins them. Nick Montalbano and Joe Siecinski will split second base, and Derek Patrocinio and Alex Wallerstein will back up Candito at catcher. The outfield candidates are Mike Paradise, Kevin Green, Trevor Yelencsics, Jared Mincey, Zabala and Wojciechowski. Returning players: Mike Zinno (Sr., P/SS), John Wong (Sr., 3B), Herb Smith (Sr., 1B), Billy Dumchus (Sr., P/OF), Rocco Mazza (Sr., 2B). Newcomers: Kyle Herron (Jr., OF), Corey Yelenscics (Jr., C), Quinton McCarthy (Sr., OF), Andrew Horenbein (Jr., P/OF), Brian Sklar (Sr., OF). Outlook: The Hawks will be at their best in low-scoring games when either Zinno, Dumchus or both are pitching and getting offensive support. After graduating 11 seniors, including seven starters, the preseason was an open competition for starting positions and the seniors have been a pleasant surprise. Herron has shown pop in his left-handed bat, but the lineup will rely heavily on that same duo. Zinno enters his third year as a starter, though he is moving from second base back to his natural position, and Dumchus will bat third and patrol center field when not on the mound. Thanks to an explosive offense, the J.P. Stevens High School baseball team came to within a win of advancing to a state sectional title game but ran into North Hunterdon's Jason Knapp. Knapp was arguably the best pitcher in the state last year and was a second-round draft pick of the Philadelphia Phillies. Stevens was certainly not overmatched by Knapp. In fact, the Hawks gave Knapp all he could handle in an 8-7 loss. After the game, Knapp told J.P. Stevens head coach Dave Marzano that the Hawks were the best hitting team he faced. Unfortunately, Stevens graduated 11 seniors from last year's team, including seven starters. The good news is the team's No. 2 starter from last season and its closer return to make a formidable one-two punch in the rotation. Senior Billy Dumchus will take over the No. 1 spot in the rotation from Connor Medler. Medler is currently pitching for Rutgers- Newark and picked up an impressive win last week over Johns Hopkins. Medler went 9-1 for Stevens last year. Shortstop Anthony Montalbano is also gone from the lineup. Montalbano saw some mound time last season and is currently playing for Swarthmore College. This year's team will undoubtedly look to Dumchus and Mike Zinno to take over as team leaders. Dumchus is also expected to take over centerfield when not on the mound. Zinno makes the move from second base to shortstop. "Mike did a really nice job as our closer last year," Marzano said. "Hopefully, he can make a smooth transition into the starting rotation." Although not starters on last year's 17-8 team, Rocco Mazza and Jon Wong return to the team with significant varsity experience. With Zinno moving to short, Mazza is expected to take over full time at second base. Wong saw action at third when Medler was on the hill and will take over the starting job. Key newcomer Kyle Herron will fill a void in the outfield with the loss of Brad Newman and Jesse Sattler. "Jesse and Brad were great leaders," Marzano said. "They were the type of kids you love to have on your team." Herron will likely end up at one of the corner outfield positions, with Dumchus possibly moving to centerfield when not pitching. "Kyle hit the ball harder than anyone on the team in our scrimmage with Bridgewater-Raritan," Marzano said. "He hit line drive after line drive." Junior Cory Yelensics appears to have earned the starting position behind the dish after scrimmaging well last week. "He's been hitting the ball well and doing a nice job defensively," Marzano said. "It's still early, and we have a lot of competition for vacant positions." J.P. STEVENS 8, EAST BRUNSWICK 4: Mike Zinno entered the game with the bases loaded and one down in the sixth, but escaped the jam to help the top-ranked and unbeaten Hawks win their fourth straight. East Brunswick (0-5) rallied behind RBI singles from Doug Fischer, Nick Prevete and Robert Mignone to make it an 8-3 game. Following a hit batsman, Zinno was called upon to end the comeback. He forced the first batter into an RBI groundout, and struck out the next to get out of the inning. Zinno closed out the seventh, picking up his second save. He also helped his own cause, going 2-for-3 with two runs scored and an RBI. Starting pitcher Billy Dumchus recorded the win (2-0) going four innings, striking out four and only allowing one hit. John Stillitano got J.P. Stevens (4-0) on the board with a two-run double in the first. Connor Medler followed with an RBI single. In the home third, Evan Jay laced a two-run single with two out. Zinno followed with his RBI single and Anthony Montalbano extended the lead to 8-0 with an RBI double. J.P. Stevens' prowess on offense was duly noted long before it opened its season yesterday with a 16-hit assault that consisted of 13 extra-base hits, including nine doubles and three home runs, against archrival Edison. EAST BRUNSWICK — Willie Beard's fastball had plenty of pop and his curve was breaking sharply as he warmed up prior to Saturday's Greater Middlesex Conference Tournament final. But by the time the senior right-hander, who had surrendered just one hit in 14 previous GMCT innings, took the mound at East Brunswick Tech, his heater was flat and his deuce was hanging. "When I was warming up in the bullpen it seemed like I was throwing all right," Beard said. "When I came out on the mound I didn't feel bad, but it just wasn't there. My curveball wasn't getting over at first and my fastball started to slow down." Pitching on three days rest for the first time all season, Beard threw 136 pitches and got some much-needed offensive support from his teammates while gutting out a 7-6 victory over J.P. Stevens that carred the top-seeded Spotswood High School baseball team to its first GMCT championship. The milestone came less than 24 hours after the Chargers claimed their first sectional title — a Central Group II crown — with a 1-0 victory over Somerville. In between championships, every starter on the team, except Beard and freshman shortstop Cody Pace, attended Spotswood's Senior Prom on Friday night. "It's been unreal," Spotswood coach Glenn Fredricks said. "It took 30 years to get here and we won a sectional and a county title within a 24-hour span. Plus, they had to do a little dancing (in between)." The Chargers, who ran themselves out of two potential rallies earlier in the game, finally remembered how to dance around the bases when they sent 11 batters to the plate in a six-run, fifth-inning rally. The outburst erased a 3-1 deficit and chased Hawks ace Doug Wislinski. J.P. Stevens coach Dave Marzano contemplated pulling Wislinski (6-4) before the damage was done, but the fifth-year mentor had seen his senior right-hander escape jams so many times before, he was just waiting for him to perform another Houdini act. "I thought about it," Marzano said of pulling Wislinski, who left the game after throwing 100 pitches. "Doug's been able to work out of jams throughout the season and I had a lot of confidence that he would be able to get us out of this one." While the Hawks had played long ball to build their 3-1 lead — a two-run homer from John Stillitano in the third and a solo blast from Anthony Montalbano in the fifth — Spotswood chipped away for all of its runs. "As long as we stayed patient, like we always do, the second or third time around (the order) I knew we were going to get to him," Fredricks said, "and this time it just happened to be the third time around. We are the kind of club that just waits for the big inning and that's what happened today." The Chargers (24-4) strung together three straight singles to take a 1-0 lead in the second. They parlayed five singles and four walks into their six-run rally for a 7-3 lead. Designated hitter Mike Collins' two-run single snapped a 3-3 tie. Spina's second RBI single of the game and Brian Curci's bases-loaded walk off reliever Connor Medler produced two paramount insurance runs. Medler worked out of the bind with a 5-2-3 double play. J.P. Stevens rallied in the seventh, loading the bases with one away before Brad Newman closed the gap to 7-4 on a run-scoring fielder's choice groundout. Mike Zinno followed with a two-run single as the Hawks closed to 7-6. With Zinno on first and two away, Dan Belowich struck out looking on three straight pitches, including Beard's 136th of the game, as the Spotswood ace was finally able to escape the jam. "I'm sure pitching on three days rest affected me but I'm not going to make an excuse like that," said Beard, who improved to 11-1 and was named Tournament MVP with his third straight GMCT victory. "My stuff just wasn't there today and I had to battle through. The team just backed me up. They were awesome." Beard, who will attend Rutgers University on a baseball scholarship, fanned seven to surpass South Amboy's Brian Seres as the GMC's leader with 107 strikeouts on the season. He scattered eight hits, walked three and hit a batter. "To look up at Willie in the second inning knowing that he didn't have his stuff, I still know that it was Willie on the mound," Fredricks said, "and no matter how many runs he was going to give up, we were going to score more. He didn't have his good fastball and he didn't have any of his breaking stuff, but that's the kind of player Willie is. He's going to gut it out and make sure this team wins." Jesse Sattler went 3-for-4 with a double and two runs scored for the 11th-seeded Hawks (14-12), whose bottom of the order let them down. J.P. Stevens' last three hitters went a combined 0-for-9 with five strikeouts. Spotswood (23-4), which had six different players score at least one run, will play Sterling in the state Group II semifinals 4 p.m. Tuesday at New Egypt High School. Dave Marzano knows better than anybody that baseball is a game of inches. The J.P. Stevens coach, who played at the high school the last time the Hawks appeared in the Greater Middlesex Conference Tournament championship, was six inches away from making a game-saving catch in the bottom of the 11th inning of the 1988 final. "I was halfway over the fence," Marzano recalled. "My feet and part of my stomach were on one side of the fence. The upper half of my body was on the other side of the fence. I was six inches from the ball." The home-run ball that eluded Marzano's glove catapulted Carteret to a 4-2 victory and left an indelible impression in the All-State centerfielder's mind before he headed off to Wake Forest University on a baseball scholarship. "I keep thinking to myself that I could have made the play and extended the game a little longer," Marzano said. "It's funny . . . I always tell everybody baseball is a game of inches." Now that Marzano has guided the Hawks back to the GMCT final following an 18-year hiatus — 11th-seeded J.P. Stevens (14-11) will face top-seeded Spotswood (22-4) 3 p.m. today at East Brunswick Tech — he made certain to hammer home the point to his players following their final practice on Friday. "This is something that you are going to remember for the rest of your lives, win or lose," Marzano said. "I still think about missing that ball that I was just inches aware from. Just give it all you've got and leave it on the field." J.P. Stevens opened the year with four consecutive defeats. Despite the losing streak, Marzano saw something in his club others did not. The coach felt all along that the Hawks could contend for a GMCT crown. "I remember saying to the guys that if we make the plays that we are supposed to in the field, we can play with anybody," Marzano said. "It was just a matter of suring up the defense. I wasn't asking them to make outstanding plays, just the routine plays in the field. I thought we had decent pitching and I thought our bats would keep us in games. I do remember saying we could win a county championship." The team's hopes of winning the first GMCT crown in school history rest on the capable shoulders of senior right-hander Doug Wislinski, who overcame a slow start to surrender just four earned runs in his last 33 innings. While Spotswood ace Willie Beard (10-1, 1.76) has deservedly grabbed the bulk of the headlines this season, Wislinski may be the conference's most underrated hurler. He sports a 6-3 record with a deceptive 3.32 ERA. Twenty of the 24 earned runs Wislinski surrendered this season came during his first 17 innings of work when the cold weather made it difficult for him to stay on top of his curveball and some nagging pain in his throwing shoulder made him less confident on the mound. Since then, Wislinski strung together 19 consecutive innings without surrendering an earned run. The streak was broken in the opening frame of a 7-2 GMCT semifinal win over Carteret during which Wislinski's own wildness — three walks and a hit batsmen — led to an earned run. Wislinski is intelligent and throws hard. The latter may be a detriment because the Chargers are one of the league's best fastball hitting teams. If his curveball is sharp enough to keep Spotswood off balance, Wislinski is capable of trading zeroes with Beard. "He's a great kid and he's one of our captains," Marzano said of Wislinski. "He's taken on a big leadership role. He got all the guys together (during the offseason) when they had captain's practices. He wants the ball and anything he can do to help the team win, he will do." Although its defense had occasion to betray the team at times earlier this season, J.P. Stevens turned in a spectacular effort in the field yesterday. Superb plays by second baseman Mike Zinno and third baseman Ryan Brady backed a five-hit pitching performance by Doug Wislinski to send 11th-seeded J.P. Stevens to a 7-2 victory over 15th-seeded Carteret in the semifinal round of the Greater Middlesex Conference Tournament at Middlesex County College in Edison. J.P. Stevens (13-9) will play top-seeded Spotswood for the championship June 2 at East Brunswick Tech. Cody Pace knocked in three runs and John Berner drove in two to lead Spotswood to a 7-1 triumph over fourth-seeded Iselin Kennedy in the other semifinal. Wislinski (5-3) overcame an early bout with wildness to settle in for a solid performance over the final six innings after he'd issued three walks and hit a batter when Carteret (14-9) scored a run in the top of the first. J.P. Stevens promptly grabbed a 2-1 lead in the bottom of the first which Anthony Montalbano opened with the first of his three hits, a double to left. Connor Medler singled one out later, Montalbano scored on a passed ball, John Stillitano singled and Brad Newman broke the 1-1 tie with an RBI single on the infield. J.P. Stevens broke through with four runs in the third to take a 6-1 lead. Zinno's bunt single was the only hit in that frame, which saw Carteret commit three errors. Those kind of misplays were notably absent from J.P. Stevens' performance, as Brady made a diving catch at third base of a foul bunt in the fourth, Zinno's diving catch at second started a double play in the fifth and Zinno made a spectacular grab of a popup in the sixth. "Our defense played great," Wislinski said. "If we make plays, we'll be in every game because our team can hit." Wislinski finished with five walks and four strikeouts. He walked just two over his final six innigs, yielding Carteret's second run in the seventh on an RBI triple by Byron Lewin with two out. "Wislinski's a grinder," J.P. Stevens coach Dave Marzano said. "He threw 118 pitches, but he never gave up. I was ready to take him out in the seventh inning, but he said he wanted to stay in." Mike Hohman scattered eight hits and two walks, yielding just one run for Spotswood, which erased a 1-0 deficit with two runs in the fourth inning. The first of those scored on Pace's RBI single and the second on a first-and-third play when Pace, at first, got himself hung up in a rundown and was eventually tagged out while Phil Spina came in from third. Spotswood (19-4) scored five in the sixth inning, two on Pace's second single of the game, one on an RBI single by Hohman and the final two on Berner's triple to deep center. Iselin Kennedy (16-10), the fourth seed, had taken a 1-0 lead in the third on Brian Schroeder's RBI single. Mike Cabonilas finished with three hits in four at-bats for Iselin, while Mike Kubu and Mike Giordano each had two hits in the loss. Spotswood coach Glenn Fredricks and J.F. Kennedy coach Jerry Smith both said before the start of this season that the top half of the Greater Middlesex Conference Blue Division may be stronger than the top half of any other division in the league. Now that both of their teams have advanced to the semifinals of the conference baseball tournament, which will be contested today as a doubleheader at Middlesex County College, maybe others will stop taking the Blue Division, which consists of NJSIAA classified Group I and Group II schools, lightly. The top-seeded Chargers (18-4) and fourth-seeded Mustangs (16-9) will meet for the third time this season at 2 p.m., while a pair of Cinderella teams — 15th-seeded Carteret (13-8) and 11th-seeded J.P. Stevens (12-9) — will square off at 11 a.m.
"I think the Blue Division goes deeper than the two of us," Smith said. "It's just that us and Spotswood get out there and we try to play the best teams around. Whether it be the Red (Division), White (Division) or Somerset County, we try to showcase ourselves more and show that there is talent in the Blue." The Mustangs' nonconference and out-of-division schedule included the likes of Montgomery, Immaculata, Hillsborough, J.P. Stevens, Edison and Union. Spotswood has gone out of division to face Ewing, Point Pleasant Boro, Immaculata, East Brunswick, Old Bridge, Monroe, North Brunswick, East Brunswick and North Hunterdon. The strength of their schedules has prepared both schools for the postseason. GRIMES VS. HOHMAN: J.F. Kennedy junior right-hander Chris Grimes (5-0, 3.10 ERA) will face Spotswood senior right-hander Mike Hohman (5-1, 2.29). Hohman, who will play at Kean University next year, has fanned 31 batters and walked just eight in 34 innings. He has faced the Mustangs twice this season, posting a 4-3 victory and dropping a 5-4 decision. "Yes," Smith said, "we did see him twice, but I think that stuff goes out the window. It's just going to be two teams battling it out. Obviously we know what he throws and stuff like that. Mike Hohman is very underrated." Fredricks has forever maintained that he has as much confidence in Hohman as he does in Rutgers University-bound ace Willie Beard (8-1). Grimes has not pitched against Spotswood this season. Rafael Cordero (7-3) earned the start in both regular-season games against the Mustangs. Grimes injured his shoulder diving back into second base in the team's season opener and missed the first half of the season. His return to the lineup, offensively and on the mound, enabled the Mustangs to rebound from a slow 6-6 start. J.F. Kennedy has won 10 of its last 12 games. "He just mixes it up," Smith said of Grimes. "He's not going to over power anybody. He's got control of three pitches — fastball, curveball and change." DID YOU KNOW? J.F. Kennedy is the lone GMC school to beat Spotswood this season. The Mustangs scored a 5-4 win in the second meeting between the schools. ONE-RUN GAMES: J.F. Kennedy's 3-2 victory over Perth Amboy in the GMCT quarterfinals on Thursday was the ninth one-run game that the Mustangs have been involved in this season. Smith's club is 6-3 in such games. DOMINANCE: Spotswood, which has won five straight Blue Division titles, owns an 8-1 record over the past four seasons against the Mustangs. "It's such a rivalry," Smith said. "I'm calling it a rivalry but we've only beaten them one time. "I know our players respect them. We have the utmost respect for them and I think it's sort of a mutual respect from them to us, too. It's really developed into a rivalry that a lot of people don't get to see." IMPRESSIVE AT THE PLATE: The Mustangs, led by Temple University-bound shortstop Rafael Cordero, the school's career record holder for hits, have scored 13 or more runs in a game five times. "When those kids go up to the plate," Fredricks said, "they have a plan. They don't have any wasted at-bats. They are a tremendously coached team, so knowing that going in, your pitcher and your game management really has to be on point or you can get yourself in a lot of trouble." WILL THE GLASS SPIKE FIT? Carteret and J.P. Stevens are clearly the Cinderella teams of the GMCT. The Hawks opened the year with a four-game losing streak and dropped seven of their first 11. Carteret was 8-7 before winning five of its next six. The Ramblers take a 13-8 mark into today's semifinal. They currently sit in a fifth-place tie with Sayreville in the win column of the White Division standings. "I knew we would be better late in the year," Carteret coach Paul Nelson said. "We kept saying that we are going to be a pain in the neck in the tournament." The Ramblers defeated second-seeded Edison and defending GMCT champion St. Joseph to reach the semifinals. Junior right-hander Al Tampa was the winning pitcher in both of those games, striking out 20 and scattering seven hits in 14 innings. Mark Makwisnki will get the start today against the Hawks, who are batting .305 as a team. John Stillitano (.479) and Brad Newman (.419) lead J.P. Stevens offensively. Hawks' coach Dave Marzano, who has maintained all along that pitchers Connor Medler (3-4) and Doug Wislinski (4-3) form one of the best 1-2 starting combinations in the league, knew all along that his team simply needed some time to gel. Since its early struggles, J.P. Stevens has won 12 of its last 16 including a stunning 6-5 upset of third-seeded South Brunswick in Thursday's GMCT quarterfinals. Wislinski, who picked up the save in that game, will get the start today against the Ramblers. "Doug has been our go-to guy," Marzano said. "He took us down the stretch. He wants the ball. He's got a fastball, curveball and a good changeup. He throws probably in the low 80s." MIRROR IMAGE: Nelson said he believes the Hawks and Ramblers are mirror images. "When I saw their pregame," Nelson said, "I said, "That's us. That's what we look like.' We are very similar. I think they have a little bit better pitching than us but I think we may be a little better defensively. "J.P. Stevens is a well coached baseball team. They are scrappy and they believe in themselves. They have a very positive attitude. They keep saying to each other, "Anything it takes to win.' And that's what they do." HELLO NEWMAN: In J.P. Stevens' 19-9 win over Colonia on Monday, Brad Newman went 5-for-5, hitting for the cycle with two homers and 10 RBI.